A successful trip to Crofton Manor saw Andrew win the Advanced Medium to Music on Cortaflex Varisto with 74% completing their qualification for next years Winter Regional Championships. Mitchell’s Santorini Hit won the PSG with 71% and the PSG to Music with 76% meaning this horse is on top form as he heads of to compete at his first Premiere League show next week at The College in Bedfordshire. Wild Angel was 2nd to Santorini in both classes and Habanero scored a personal best in the PSG with 69% taking 3rd spot. Natasha Mitchell who owns many of Andrew’s top horses has recently purchased five broodmares and the first foal was born this afternoon in Holland. The chestnut colt is by Sir Donnerhall out of a Jazz mare. The mare and foal will move to England once the foal is strong enough and we shall keep you posted on the other ones as they arrive. Mitchell’s Rubinho one of the new additions to Andrew’s stables won the Medium at Step by Step Dressage today completing his qualification for the Summer Regional Championships in just two shows. The striking black gelding by Rubin Royal was purchased last year from the Equine Elite Auction in Holland by Natasha Mitchell and Andrew is excited about his potential as a top class horse. Andrew headed to Oldencraig today with four horses. Wild Angel convincingly won the Inter I with 67.5% her first attempt at this level. She has been unbeaten this year at PSG and Inter I level. Habanero won the PSG and Cortaflex Varisto won the Advanced Medium. Andrew has now completed his qualification on 5 horses for the Summer Regional Championships from Medium to PSG level. Andrew has been given a wildcard in the Advanced Medium Open riding Mitchell’s Santorini Hit. The horse who just missed out on qualification at Patchetts Regional Championships will now go head to head with stable mate Wild Angel in one of the hotly contested classes of the Championship. Andrew also has qualified Wild Angel for the Advanced Medium Music following her 2nd place at the regional championships. 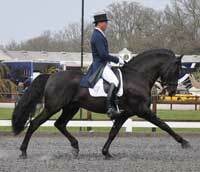 The Winter National Championships take place at Hartpury College in April.